STRAW is dried grain. It is the material of choice for many people who build their structures without major machinery. 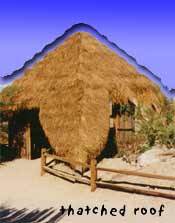 In many countries, straw is used for roofing and for walls. Straw bales are often used for structures too. Straw bales are blocks of straw that are compressed together into large blocks. These blocks are stacked upon each other to create solid walls. Let's remember in The Three Pigs story, the first pig made the decision of building with straw. The big BAD wolf blew his house down easily. But was it such a bad idea, to use straw? When building materials are hard to come by straw might be the best idea around. Hay balers, invented around the 1850's, created the first blocks of hay and someone must have decided to try to construct these huge bricks into a structure. Nowadays, people have discovered that straw bales are less costly than other building materials and that buildings can be constructed in a more environmentally-friendly was with straw bales. Where othermaterialst need to be manufactured in factories and shipped, which causes pollution and waste for the planet, straw bales are sustainable, reusable, inexpensive to produce and often locally produced.